Figure 1. 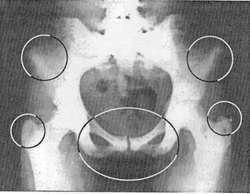 In this x-ray of the pelvis, the pubic bone is barely visible and the ischium is almost entirely invisible due to the lysis or destruction of bone substance. In the films shown below, note the incredible changes after non-toxic therapy. Figure 2. The pubic bones are now well-defined and represent a remarkable rebuilding of bone and halting of the cancer process. 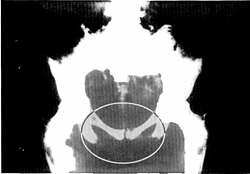 The ischium are also reforming and the ilii (hip bones) likewise show diminution of bone lysis. No sane, honest physician could call this a "spontaneous remission". 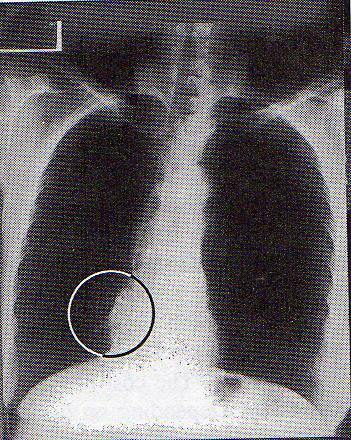 On November 30, 1993, after three months of therapy, the improvement was even more dramatic and impressive. Figure 3. Both the pubis and the ischium are well defined and bone is further reappearing in the ilii and the femurs (thigh bone). When these x-rays were taken, the tumors in the left breast had improved by 70% and those in the right breast were reduced by 30%. In May 1994, Dr. Sodi Pallares informed me that the patient was in excellent condition and continues to improve. The second case is a 57 year old woman that was first seen by Dr. Sodi Pallares on July 31, 1992. She related that in February 1991 she was suffering intensive pain in the right buttock. Diagnostic studies revealed a malignant schwannoma (nerve sheath cancer) with destruction of the 11th and 12th thoracic vertebrae of the spine (fig. 4). Figure 4. On the right side of this film, a spherical mass can be seen (indicated by the circle). In the film on the left (frontal projection), the same tumor is visible to the left of the midline. (Previously in March 1991, the patient began a series of twenty radiation treatments which resulted in serious damage to the patient's general condition. 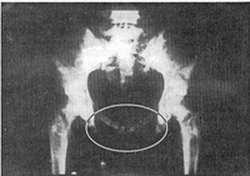 She lost thirty pounds, became extremely weak, lost her appetite and developed intensive pain in the lower back and in the frontal pelvic area fig. 5). Figure 5. Even after receiving radiation treatments from her first doctor, the tumor continued to spead. 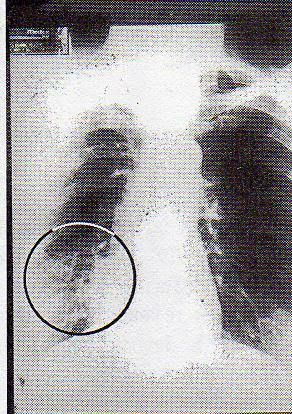 The circled area shows an obvious enlargement of the tumor mass on the left side of the film (right lung field). Because her condition was worsening she sought the help of Dr. Sodi Pallares who then started his three-pronged attack with diet, polarizing solution and magnetic field therapy (200 gauss for 4 or mores hours daily). Dr. Sodi Pallares commented to me in his letters, "The improvement came slowly but without interruptions. The frontal projection of the tumor showed marked reduction" (see fig. 6). Figure 6. 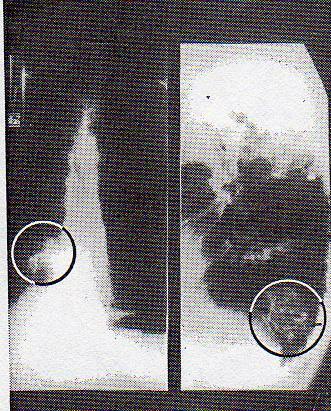 Comparison with the previous x-rays shows a dramatic clearing of the tumor after receiving Dr. Sodi Pallares' therapy. "The patient recovered 11 Kg (27.5 pounds), had no more pains and the general condition is now very satisfactory. The patient has been under my care during 18 months." Dr. Sodi Pallares can be contacted at: Demetrio Sodi Pallares, M.D, Bravo 31, San Jeronimo 10200 Mexico, D.F.